I was shocked to learn that many people don’t like coconut. I like coconut so much, that on a recent venture to Grand Cayman, my friends and I actually managed to get a coconut out of a tree to eat. 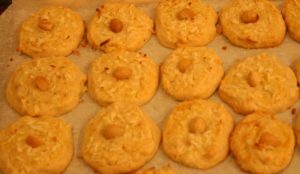 The ingredient that thew me in these cookies, which I think have a somewhat Hawaiian theme, was the macadamias, which my local grocery store apparently does not carry (yet I think they stock every Goya product known to mankind…go figure.). 1. Preheat the oven to 325oF. Spread the macadamia nuts in a single layer on a rimmed baking sheet. Toast them about 10 minutes, or until they are light golden and fragrant. Let them cool, then halve about 22 of the nuts. Finely grind the remainder and set aside. 2. In a medium bowl, whisk together flour, baking powder and salt and set aside. In a large bowl, beat together the butter, shortening and sugar until light and fluffy, 3 to 4 minutes. Beat in the 2 eggs, vanilla and lime juice. Add the flour mixture, ground macadamia nuts and coconut. Mix on low speed until just incorporated. 3. Turn the dough out on to a clean work surface and shape into an 11-inch log, about 2 inches in diameter. Wrap in plastic and refrigerate for at least 2 hours. 4. Preheat the oven to 350oF, and line 2 large baking sheets with parchment paper. Remove the dough log from the refrigerator. Using a sharp knife, cut into 1/3-inch-thick slices. Place on baking sheet. 5. In a small bowl, whisk together the remaining egg with 1 tbs water. Using a pastry brush, lightly brush the top of each cookie with the egg wash. Sprinkle with some coconut and press a macadamia nut into the center. 6. Baking until the edges are golden and the coconut on top is lightly golden. Transfer to a wire rack to cool completely.